You cannot blame Delta if you don’t update your own data at Delta.com! One thing Delta does really well is alert you when there are problems. As I talked about in yesterday’s Rookie post about seat changes, it is up to you to make sure your preferences are in place. The same goes for contact info. When I am flying I have the phone app on all the time. I can check it from GoGo up in the air and it does alert me to changes and gates etc. I pride myself at knowing where I am, where I am going and what my travel situation is. However, I also have my cell phone, my Gmail and home e-mail all updated and correct in my “Notifications” page at “My Delta” as there are times when I get so distracted reading some of the amazing blogs here at BoardingArea.com that I lose track of time and what is going on. Then suddenly my phone alerts me that something is not quite right. Delta can only do this if you take the step to make sure the data is both there and that it is up to date and correct. Don’t go yelling at Delta if you fail to take this simple step. 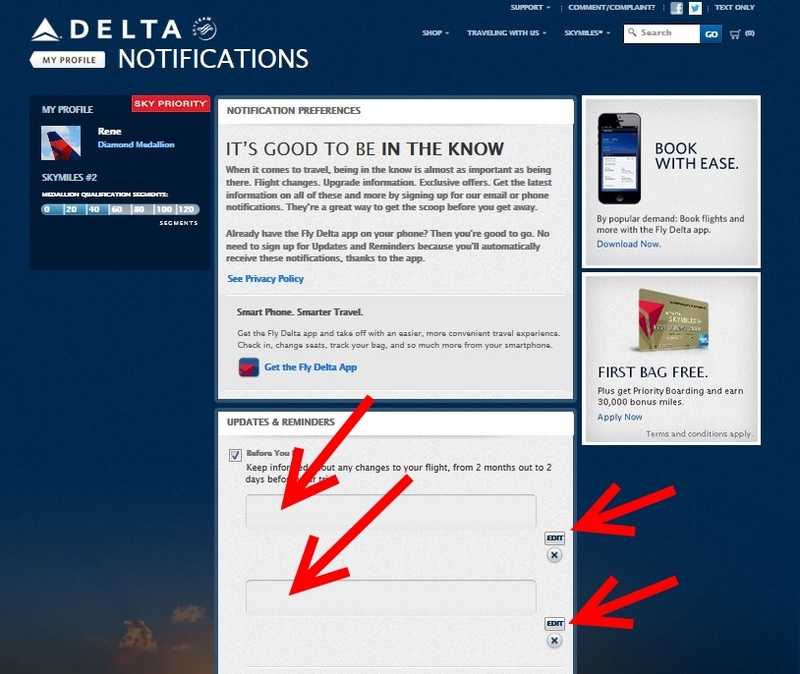 ← Thank you Delta for fixing the TINY seat scroll bar issue! Random question about seat preferences: When there is only 1 seat in an aisle (CRJ first class, E190/E175 first class, etc), is that considered an aisle seat or a window seat? When my upgrades clear, I’d like to always be put into the single seats (if possible), but I always seem to be moved to an aisle in the 2 seat row. My seat preference is listed as aisle. @Paul – wow, Delta will be all full-flat seats after 01JUNE2014 and you would earn, with that kind of spend, across both a personal and business Delta AMEX Reserve cards 60,000 elite qualifying miles thus GOLD Medallion without flying. Fly 15k and you are Platinum for the year. @WE – Delta does not have that much refinement in seat selection sad to say. Thus we have to keep checking ourselves.